(1) What is the annual carbon balance of the forest on a large scale (several square kilometers)? Which environmental variables are most important in setting the net carbon balance on seasonal and annual time scales? (2) What is the role of PBL dynamics in carbon exchange and how does it influence carbon dioxide mixing ratios near the surface? Can we quantify PBL-free troposphere exchange? (3) How can carbon dioxide mixing ratio data obtained at up to 500 m height on towers can best be used, in combination with data from other existing sites and from aircraft, to constrain the terrestrial carbon balance on regional and global scales? (4) How does anthropogenic pollution influence the regional mixing ratios and variability of carbon dioxide and other greenhouse and ozone-depleting gases? We continuously assess NEE over the largest possible area. We measure fluxes by eddy covariance 30, 122, and 396 m above the ground. We measure carbon dioxide mixing ratios at 11, 30, 76, 122, 244 and 396 m, and use these data to determine the flux divergence below any eddy flux level as the rate of change of column integrated carbon dioxide. During the daytime the footprint for flux measurements at the 396 m level is several square kilometers. At night the upper levels are decoupled from the surface due to the low-level inversion, and we use the 30 m measurements to calculate NEE. For daytime we can assess the importance of horizontal advection by comparing flux divergence estimated from the profile measurements with that estimated directly from the 122 and 396 m eddy fluxes. 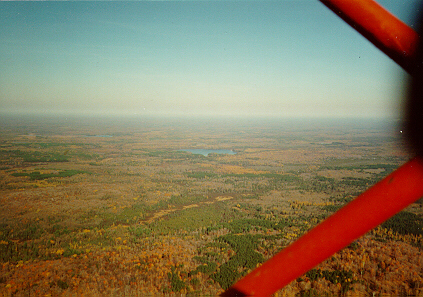 The WLEF tower is located at 45.945878 degrees N, 90.272304 degrees W, east of Park Falls, Wisconsin along Highway 182 in northern Price County, WI.